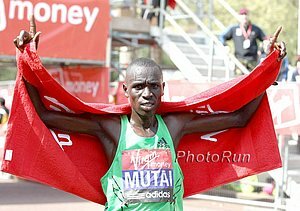 "This (World record) is very special for the Kenyans, especially beating the Ethiopians. Everyone in Kenya will be happy for me. My manager is getting a lot of calls from Kenya, and I hear there were lots of people watching TV in bars, and breaking bottles when they saw the World record." - Patrick Makau talking about his country's reaction to his 2:03:38 marathon World Record yesterday in Berlin. *IAAF: Patrick Makau Talks About His "Zig-Zag" Tactics Which Knocked Geb Out Of The Race “It is one of my tactics. I did some zig-zags, to confuse him. I had a lot of energy, and wanted to tire him. He was trying to use me, to maintain the pace, and I wanted to run alone, either behind him or to the side." *Clock Ticks For Haile Gebrselassie And Paula Radcliffe Says 6 pacemakers will take the field as far as 30k, going through the half in 62 min. 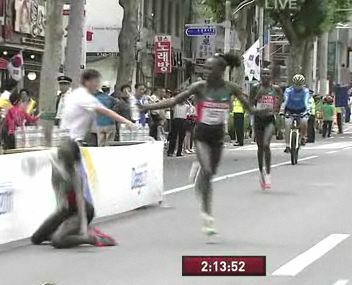 *Paula Says She Thinks She Can Win In 2012 Asked if she could beat London winner Mary Keitany, Radcliffe said: "Yes. Racing is racing. 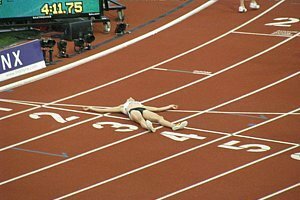 The race is not going to be run in 2.14 in London next year. It's about going in and racing. In the marathon anything can happen." 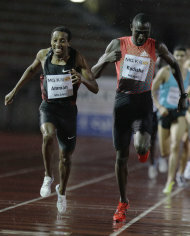 *Haile Gebrselassie Vs. Patrick Makau In Berlin Sunday Both seem eager to call the other one as the favorite. This will be Geb's first marathon attempt since dropping out of NY last November. *Pat Bucher: All Roads Lead To Berlin Butcher examines the chances of the Haile G versus Patrick Makau. 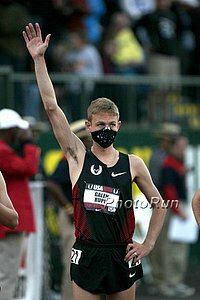 Butcher thinks it might be telling that Geb said his time is more important than winning, as he needs a fast time to qualify for London 2012. 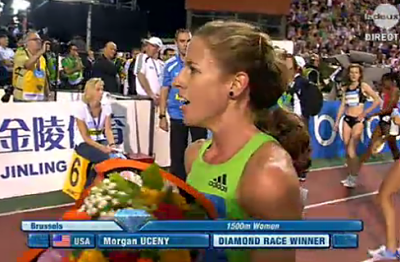 *Morgan Uceny: "Next year at the Olympics, one of those medals will be for me." *Haile Gebrselassie Talks About The Matchup Between Mo Farah And Kenenisa Bekele At The 2012 Olympics He says he doesn't think Mo Farah should move up the marathon after 2012. Emily Sisson & Ray Treacy Talk About Her Decision To Transfer To Providence After Just One Year At Wisco Sisson is the US HS record holder at 5k who bolted Madison after just one year even though her dad was a teammate of Wisco coach Jim Stintzi. 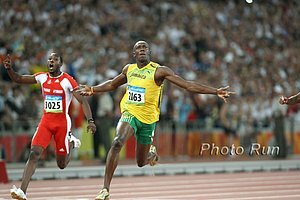 Jamaican Columnist Wonders: What Would Blake Have Run In Brussels For 200m If he improved as much from Daegu as Walter Dix, it would have been 19.23. Chicago Tribune's Philip Hersh Writes About Why He Always Is Thinking About Doping "At the end of a 20-minute interview, they asked me if I were suspicious about everything exceptional that happens in the sport. My answer: yes." Hersh says he has questions about Carl Lewis, Kevin Young, Carmelita Jeter and everyone else in the sport. We don't really blame him. 2003 USATF 5km Road Champ Henry Dennis Killed By Drunk Driver This story is not a happy one on any level. Two days after being sentenced to six months in prison for sexual relations with a student, Dennis while biking with a helmet was struck and killed by a drunk driver. *Message board thread here. Mary Keitany Smashes Lisbon Half Marathon CR In 67:54 Helena Kiprop was 2nd in 68:57 and Boston champ Caroline Kilel was 3rd in 1:10:03. Pre-Race: The Wall Street Journal Looks At The Magic Of The 4-Minute Mile In Anticipation For 5th Avenue Quotes from Jenny B, Lagat and many more, including Eamonn Coghlan and Ray Flynn. Paula Radcliffe Talks About Mo Farah's Coming Of Age Paula: "I can remember Mo with the dreadlocks, running around the pool and getting told off, saying 'Can't you stop that noisy little boy jumping in the pool?'" Half Marathon WR Holder And London Marathon Champ Mary Keitany Up Against Boston Winner Caroline Kilel In Lisbon Half Marathon On Sunday For the men, 2010 World XC silver medallist Teklemariam Medhin. Switzerland's Viktor Röthlin is also in the field and then apparently "Blade Runner" Oscar Pistorius is in the in the "8K mini marathon"? Lisa Koll To Return To Action At Next Month's Medtronic 10-Mile US Champs Vs. Katie McGregor & Blake Russell, Abdi To Take On Fasil Bizuneh And Fernando Cabada Koll has been sidelined with injury for most of the track season. After Fall In Brussels Cost Her $50,000 And A Perfect Season, Sally Pearson Returns To Australia And Receives Helicopter Ride And Keys To City She's turned her attention to the Olympics and a possible World Record in 2012. Rec. Read: Mo Farah's Rise A Collective British Success Story A lot of people had a hand in Mo's success, including the London Marathon, which supported him in college. 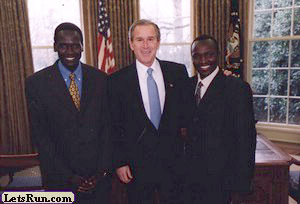 Plus some interesting tidbits you may not know about Mo, like how he almost joined the Army, has a song about him in Somalia, and jumped into the Thames after a night of drinking. Kisorio is now the third fastest man in history and Sammy Kitwara is now the fastest loser in history, as his 58:47 didn't get the job done even though he's now the 4th fastest man in history at 13.1. *Bobby Curtis Runs Very Solid 61:52 In 13.1 Debut Not bad for a guy who said pre-race he wasn't in top shape yet and is getting ready for the ING NYC Marathon. JK's conversion chart says Curtis' 27:24 10,000 PR converts to 60:39. *LRC MB: Philly RnR Half Short?